Keep dishes clearly marked and organized with the Royal Paper R801 3 1/2" bamboo paddle pick! Using this pick makes it easy to keep track of your customers' food as you can organize dishes by using various pick designs. The pick is also useful when serving appetizers, kabobs, and satay dishes, as its 3 1/2" size makes it easy for your guests to pick up individual portions at your banquet hall or catered event. It's also great for garnishing beverages with olives and fruit wedges. I used these 3 1/2 inch bamboo paddle picks for picking up appetizers. I also used them to differentiate if red meats were cooked for certain doneness by marking colors on the top of the picks. It was important for me to have eco friendly, bio degradable products throughout my bridal shower and wedding. Happy my bridesmaids listened and followed through. These picks are the perfect size to use for the bar and bar fruit. It's nice knowing they are eco friendly so we're not harming the environment. Absolutely loved these for our offsite catering event! Very sturdy and small enough for bite sized portions. Had plenty for my guests and they even held up our very fragile soft taco shells. Would order again. Really sturdy, very smooth picks. These are several times thicker than a standard toothpick, so they’ll hold up really nicely to almost anything you can stick on them. Like the other bamboo products on this line, they are greenish on one side and a natural wood color on the other. It's incredible how versatile these skewers are. We loved using Eco-Friendly Bamboo Paddle Pick. Very elegant and easy to use. ONe side is green and one side is white. Fantastic price for bamboo pics! They were perfect for My catering event and made the appetizers look amazing! Will definitely vebe purchasing this product again! We purchased this for our wedding. We used it to make rainbow fruit sticks, and this was a good size for this particular purpose. It worked wonderfully, and the price point was great, too! when toothpicks doesn't get the job done, these are the perfect bamboo pick. they add an extra special touch to your food and look great. best park they are made from bamboo which is great for the environment. These small bamboo picks are adorable. We use them to secure sandwiches, to make mini caprese skewers, and even to mark platters. They provide just the right extra touch over traditional skewers. Good pick that is a nice upgrade from a traditional toothpick. We have used these for tasting events to stick in meatballs or other smaller single serving items. We get lots of compliments on our bamboo products at events. This will be your go to picks for every single dinner party. These are much sturdier than normal picks and your guests will love that they are eco-friendly! These 3 1/2 inch bamboo paddle picks are handy for using in tall sandwiches to keep them together and the bread from sliding off the top. For our catering events, these are our go-to picks. They're very strong, and look much nicer than a basic pick or skewer - and being made from bamboo - they're earth friendly. We used these for a cheese and meat try at an event. they are great & heavy duty enough for pretty much anything. the pick is a bit thicker then a regular old toothpick, so its not necessarily good for all the same things a toothpick would be, but these are so cool looking and being eco-friendly makes them that much more great! be aware some are green vs tan, and some have both colors on one pick. They give off a kind of rustic vibe and thats what i love about them.. but if you are looking for something more clean and elegant, these might night be your best bet! they really are wonderful though, and i will use again and again! I ordered both sizes and enjoy both. The 3in bamboo picks are perfect for Bloody Mary's or small appetizers. Great product for the price! I will definitely re order! The price for these Royal Paper eco-friendly bamboo paddle picks is less than from my broadline distributor or the prices on Amazon. Win-win! These are a good size for a slider. Royal paper 3 1/2" eco friendly bamboo paddle pick. They came in a package of 100 and are easily used for special foods or just for fun. They help keep sandwiches together and also can be used as a toothpick! Can order by the bag (each), or the case. Each pick is one solid piece, and each of the 1000 ordered arrived in perfect condition. Many possibilities for these picks, including product identification. I love the quality of these Paddle Picks. Our customers always comment about how nice they look. I like how sturdy they are for heavier appetizers. I love these little cocktail sticks to serve samples of different cookies and bars or brownies at our bakery. Something about food on a stick just looks so appetizing. This is a great pick for appetizers. It is very sturdy and paddle makes it easy to grab. This is a much nicer alternative to regular toothpicks. The price is right for this perfect little item!! Perfect for sandwiches of anykind. Bamboo is heavy duty and holds up well. The paddle top makes them easy to grip for accurate placement. Great additions to my kitchen. These are so much sturdier than I expected! Hands down a way better choice over flimsy toothpicks. I purchased these for a cheese display I’m making for a garden party this summer. I’m a home baker, so I just think these add a little professional touch and the price is on point. These are great for making cupcake picks, the little flat paddle top is great for sticking images or characters on. Great price too, would definitely buy these again. Very nice construction. Well made product with no splintering or cracking. Can be used for sandwiches, cheese, fries, tots or anything you want to stay together. Highly recommend. These are sturdy and attractive picks. We use them for our appetizer size meatballs and to skewer sliders. We serve bamboo forks and knives and I like that these compliment the plate ware that we are using. nice and sturdy these don't seem like they will crack very easily under pressure or anything like that. great for holding a variety of things together. 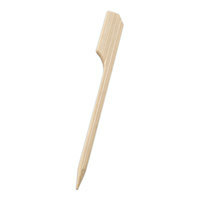 Eco-friendly bamboo paddle picks are great for sliders, or anything that you need to put a toothpick style piece into. Nice look and thick wood so they don't crack. This paddle pock is great. It's sharp and easy to stick in food. Most importantly it's gives a professional and gourmet look to my dish. Great little pick. I use for appetizers to give them a professional look. One of my face thing to do is skewer on a small tomato, a piece of fresh basil, and a small ball of mozzarella, and then plate them and drizzle on some dressing. I purchased the 3 1/2" eco-friendly bamboo paddle pick. These shorter bamboo picks are great for small appetizers or just a single item placed strategically on the pick. A very great sandwhich holder and looks really nice when presented to customers. We use these on a variety of plates and the customer really appreciate the look. Nice looking bamboo paddle pick. It goes really well with the bamboo forks, spoons, and knives I bought here too. Next time I might order the ones that are longer. These picks are great for appetizers. They can hold heavy foods without breaking or bending. The paddle on the end is a nice touch as it really helps with holding on to your food. A lot nicer looking than using plain tooth picks. I particularly like these picks because of the paddle tip. They allow customers to get a grip on their pick which is a nice simple little thing they seem to like. Great price too! Fantastic food picks! Nice size with easy to grab paddle top! No more worrying about tacky colored frill picks contaminating drinks! Good for passed appetizers too!!! We were looking for picks with a tasteful design that is easy to pick up. These are perfect, plus they come from a renewable resource - great for eco-conscious guests! These are great little bamboo sandwich picks. A little more interesting than standard picks. I've used them to mark steaks in addition to picking roll-ups.